For Immediate Release – December 8, 2017 – Oklahoma City – After another successful year at the National Reining Horse Association (NRHA) & Adequan® North American Affiliate Championship Show, Shawn Flarida has crossed yet another milestone in the NRHA history books—becoming NRHA’s first Six Million Dollar Rider. 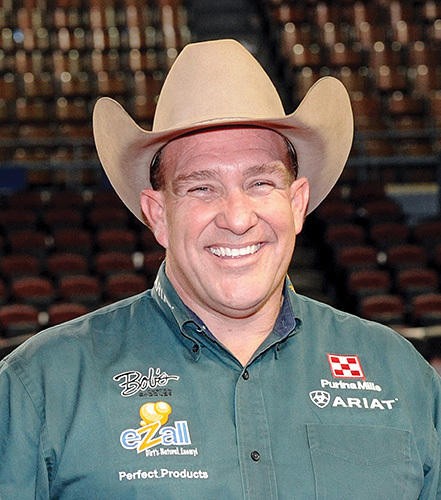 Shawn earned his first million after a successful run at the 2003 All American Quarter Horse Congress, making his mark on the sport of reining. His successes continued as he achieved notoriety within the industry by surpassing earning records with NRHA year after year. Flarida’s quest to become NRHA’s first Six Million Dollar Rider became reality during the Lucas Oil Level 4 Open Futurity Finals. With two horses in the competition, his chances of crossing this historic milestone were high. Flarida’s first run on Garry Ray Smith’s Missin My Tinsel (Hollywoodstinseltown x Dont Miss This) scored a 220, earning him 9th place and $22,287.89. George and Carol Bell’s Mr. Masota Star (Wimpys Little Step x Cee Another Masota) was Flarida’s second ride. A score of 222 ½ fell in 3rd place and earned $73,554.10—pushing his earnings just over $6 million. At just 48 years of age, Shawn Flarida has achieved many successes during his time as an NRHA rider. It is only a matter of time before the iconic green shirt hits his next record in the NRHA history books.